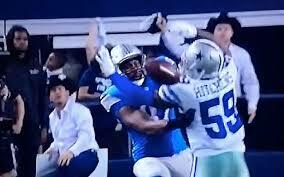 How Much did the Reversed Penalty Affect the Lions-Cowboys Game? The Lions led the Cowboys 20-17 with 8:25 left to play in the 4th quarter. On 3rd and 1 from the DAL 46, QB Matthew Stafford threw incomplete to WR Brandon Pettigrew. The officials threw a flag and announced a pass interference penalty on DAL, which would have given DET a 1st and 10 at the DAL 30. But the officials picked up the flag and never enforced the penalty, leaving DET with a 4th and 1. This was a controversial call by the officials, to say the least. So the question is, how big was this call on the outcome of the game? The Cowboys went on to win, but that doesn't mean the call caused DET to lose with certainty. Either outcome was still possible after the call. We need to think of things probabilistically. Let's break down the effect of the official's call using the new Win Probability Model. Read more: How Much did the Reversed Penalty Affect the Lions-Cowboys Game? Immediately following the huge reversed penalty, the Detroit Lions were faced with a 4th-and-1 on the Dallas 46, up 20-17 with 8:25 left in the game. The Lions decided to take the delay of game penalty, and then punt - which ended up as just a 10-yard punt. Obviously, the Lions did not anticipate such a bad punt, and we cannot judge the decision based on the outcome, but was punting the ball up three the best decision? For the final team efficiency rankings of 2014, I thought it might be instructive to break down some of the process that goes into making the sausage. AFA uses a different secret sauce than other analytics rankings sites, and if you're interested in the math behind the process, Brian has posted a detailed example of how this model spews it outs rankings here and here.